The roasted garlic dressing is as luscious as mayonnaise and gives this salad a buttery, nutty flavour. Serve it as a meat-free starter or alongside grilled lamb or chicken. 2. Cook the quinoa in simmering water for about eight minutes (don't use the absorption method for this recipe), drain and set aside at room temperature. 3. Place three-quarters of the carrots on a baking tray with two teaspoons of cumin seeds, season with salt and pepper, drizzle with oil and mix to coat. Roast for 25-30 minutes or until cooked and nicely coloured. 4. Drizzle the garlic bulb with olive oil, wrap in foil and roast alongside the carrots for about 35 minutes, or until fragrant and soft. 5. Slice the remaining carrots into 1 centimetre-thick rounds. Bring a saucepan of water to the boil and blanch them for about 15 seconds. Drain. 6. Combine the tahini, vinegar and 100 millilitres of olive oil in a small measuring jug or cylindrical container. Squeeze the roasted garlic paste out of the skin and into the jug and blitz with a stick blender, adding between 60 and 100 millilitres of water until you have a smooth and creamy dressing. Season to taste. 7. In a small bowl, toss the blanched carrots through the roasted garlic dressing. 8. 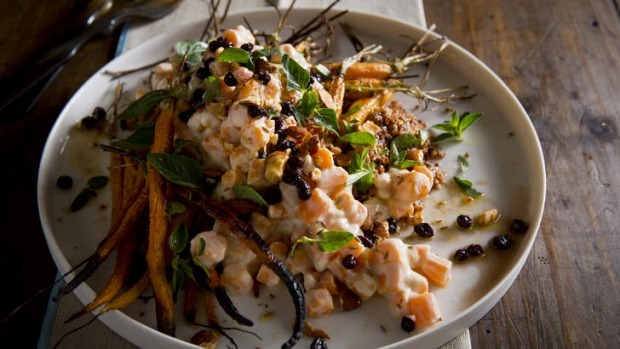 Spread the cooked quinoa on a serving plate and top with the roasted and dressed carrots, spooning over the dressing. Scatter over the currants, oregano leaves, remaining cumin seeds and almonds. Lightly season with salt and pepper and serve.